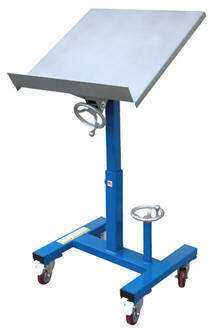 Mobile Tilting Work Tables. Designed to bring work to an ergonomically correct position, helping to foster a more comfortable and productive work environment. Working in a comfortable position also reduces fatigue and risk of injuries. Platform height and tilt angle are manually adjustable, with the exception of model ER-WT-2424-LA , which uses a 115V electric linear actuator with a hand control. Four 3 1/2" x 1 1/4" polyurethane swivel casters (two double locking) allow unit to be transportd from one work area to another while loaded. All steel construction.